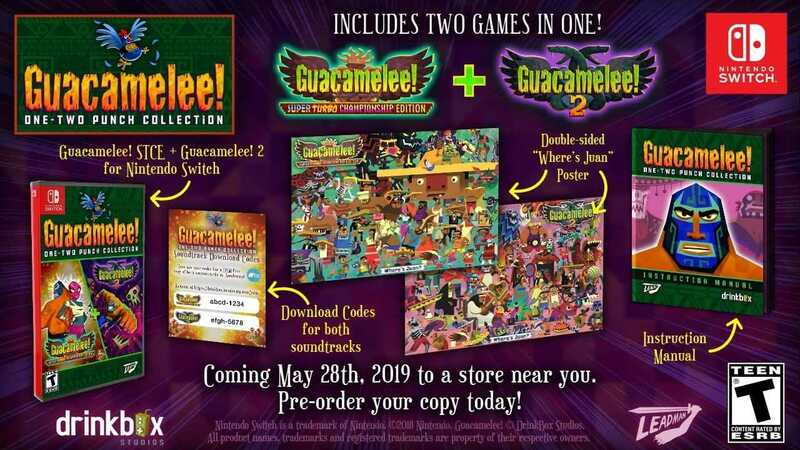 The bundle includes both Guacamelee! Super Turbo Championship Edition and Guacamelee! 2, two action-packed 2D brawlers that are a great way to spend your time. Inspired by Mexican folklore, the games also feature challenging platforming and Metroidvania progression elements, with players taking control of wrestler, Juan Aguacate, as he explores a world filled with undead enemies and sassy bosses. This double pack bundle includes an exclusive two-sided poster, an instruction manual, and codes to download two soundtracks. You can see a full feature list for the product below. – … and of course chickens. Lots and lots of chickens. Copyright © 2014 - 2019 SocksCap64, All Rights Reserved. Logos, Trademarks, Pictures Belongs To Their Respected Owners. Powered By WordPress. 85 Queries in 0.625 seconds.